The Tripitaka is the formal term for a Buddhist canon of scriptures. Many different versions of the canon exist throughout the Buddhist world, containing an enormous variety of texts. The most widely-known version is the Pali Canon of the Theravada school. — Excerpted from Vinaya Pitaka on Wikipedia, The Free Encyclopedia. 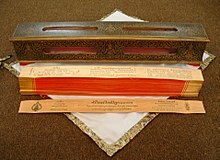 The second category, the Sutra Pitaka (literally "basket of threads", Pali: Sutta Pitaka), consists primarily of accounts of the Buddha's life and teachings. The Sutra Pitaka has numerous subdivisions: it contains more than 10,000 sutras. — Excerpted from Sutta Pitaka on Wikipedia, The Free Encyclopedia. The third category is known to the Theravada school as the Abhidhamma Pitaka. It is a collection of texts in which the underlying doctrinal principles presented in the Sutra Pitaka are restated and explained in a more systematic framework. In Mahayana and Vajrayana tripitakas, this pitaka often contains treatises that are referred to as shastras. — Excerpted from Abhidhamma on Wikipedia, The Free Encyclopedia. This page was last edited on 2 February 2017, at 16:53.